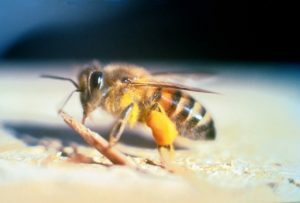 A 52-year-old cleaning lady was recently attacked by a swarm of killer bees, leaving the woman in critical condition. Witnesses say that this cleaning lady was in the house and working with three other ladies, when she went out to her car to get a mop. She then opened up the trunk and was looking around when the bees attacked her. The owner of this home heard the cleaning lady screaming, and another one of the cleaning ladies grabbed a water hose and tried spraying the bees off of her. That didn’t help, so they called 911. When the firefighters arrived, they saw that the cleaning lady’s face was completely covered in bees. They had no time to put on their protective equipment, so they grabbed a carbon dioxide extinguisher, and quickly started spraying the cleaning lady to try and get the bees off of her. The cleaning lady, and four of the firefighters, were transported to a local hospital. The cleaning lady, who was stung over 200 times, is expected to survive. The firefighters were treated and released. Witnesses say that the bees had been living in an underground gas meter, that was located near the area where the cleaning ladies parked their car. The part of this story that bothers me is that the owner of this home stated that she had previously noticed the bees living in this underground meter but did nothing about it. Ladies and gentlemen, if you ever see a colony of bees living around your home, do yourself and your friends a favor by calling a professional for help before someone gets seriously hurt or killed. This was a tough cleaning lady, and she’s lucky to be alive!